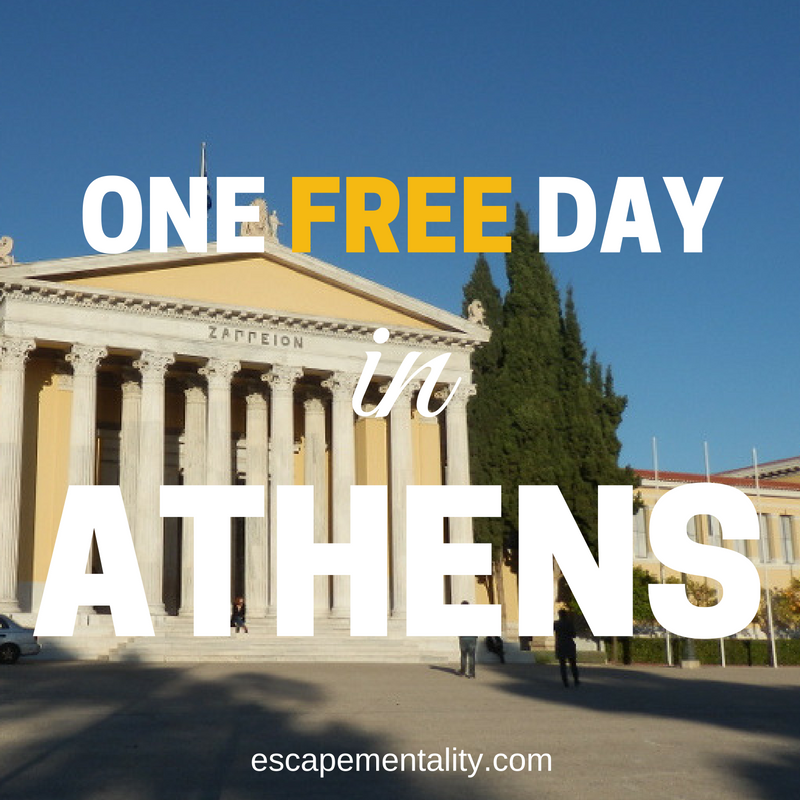 The capital and largest city of Greece, and one of the oldest in the world, Athens is a beautiful city that, contrary to my expectations, has a huge amount of free activities, especially if you plan your trip carefully. Certain museums have a free or heavily reduced price day once a week, so if you can, try to spend a full 7 days in the city to make the most of all of these opportunities – there certainly is a lot to see. We only had a few days, but were still able to get a lot done! The National Garden [Εθνικός Κήπος] is a fantastic free place to visit – not only are the gardens beautiful (featuring orchards, flowers, lakes, a cafe, statues, fountains, a sundial, a children’s library and playground, as well as some ancient ruins) but even the small zoo (featuring mainly goats and rabbits, but also some birds) is free of charge! The gardens are bordered by the Hellenic Parliament to the north, the Presidential Mansion to the east, the Panathenaic Stadium to the south, and Syntagma Square to the west.. If you take the bus or train from the airport you’ll find Syntagma Square [Πλατεία Συντάγματος] as soon as you arrive, from which you can easily visit the Hellenic Parliament, and the National Kapodistrian University of Athens is not too far away. A beautiful building, the Hellenic Parliament [Βουλή των Ελλήνων] has traditionally dressed guards (photos are OK!) and you can see the Tomb of the Unknown Soldier, while the Kapodistrian University and its Library is the first of the modern Greek state and one of the most photographed buildings in Athens. You can walk from Syntagma Square through the National Garden via the Parliament and University, down to the Zappeio and Panathenaic Stadium. The Zappeion mansion was used as the main fencing hall in the first international Olympic games, and again, 110 years ago in the 1906 Olympics as the athletes’ village. Just over the road is the Panathenaic Stadium [Παναθηναϊκό Στάδιο] associated not only with the 1896 revival of the Olympics and the 2004 games, but also the origin of the tradition of the Olympic Torch Relay. To the south of the Zappeio is the Temple of Olympian Zeus [Ναός του Ολυμπίου Διός], which costs 3 euro to visit, but can be enjoyed without paying to go in. Then, take Dionysiou Areopagitou Street [Οδός Διονυσίου Αρεοπαγίτου], which is the longest pedestrianised walkway in Athens, described as a living open-air museum, to the number 1 attraction in Athens, the Acropolis. The free map is most useful when visiting the Acropolis – the number one attraction in Athens. Although this is not a free attraction – in fact, most of the negative reviews on TripAdvisor are complaining about the fee (which is usually 20 euro) during the winter, the reduced fee of just 10 euro applies, which, considering the vast area you are getting access to and the significance of these ruins, even cheapskates like us found reasonable! (Beware though that the entry fee does not include the Acropolis museum, which is an extra 5 euro). If you do plan to make a visit, make sure to take the map with you, as there is a lot more to see than just the Parthenon, and we found the mobile signal sketchy at best. There could be more maps on site (and you won’t be given a map upon entry) so it’s a good idea to bring your own on paper so that you don’t miss anything. You can see the Odeon of Herod the Atticus and the Theatre of Dionysus for no extra charge on the same ticket, but we found these areas practically deserted as they are a bit off the beaten track. For a fantastic (and free!) view of the Acropolis, go just north to Areopagus Hill, historically significant as a place of court in classical times, the site of a temple to the Erinyes, the place the Romans called ‘Mars Hill’, and the location of the Apostle Paul’s sermon on unknown gods (which is written on a plaque there in Greek). The small climb to the top (facilitated by stairs!) is well worth the absolutely spectacular view of the city of Athens and the Acropolis. There is no entry fee, but be careful – it is slippery, so wear sturdy shoes! Dusk or dawn are the best times to go. North again is the Ancient Agora of Athens, close to the Thissio metro station. Once again, you can pay to go in (4 euro in the winter reduced from 8 euro) or enjoy from the outside. Greece is very generous in allowing visitors to enjoy significant landmarks rather than obscuring them in order to fleece tourists! It’s worth taking a look at the ruins alongside the train track, purely for the juxtaposition of new and old. Even though this is not officially part of the attraction and you don’t need to pay to get in, everything is nicely labeled! Archaeology buffs will also find a more significant free attraction in the ruins at city hall (Kotzia) square. Also make sure to visit Monastiraki Square [Πλατεία Κοτζιά], famous for its huge flea market and which includes impressive monuments such as the Tower of the Winds, the Roman Agora, and Hadrian’s Library, which once more can be enjoyed from the outside or at the reduced price of 2 euro. Nearby is the Pantanassa Church, and the Church of Kapnikarea, and although we didn’t make it over that way, on our list for next time is Filopappou Hill, where you can see the Filopappos Monument, the National Observatory, and Agia Marina. To the north of these attractions you’ll find a number of museums, as well as Lycabettus Hill, which, although is still on our list of places to visit, is the most famous hill in the city, and reportedly best in summer when cultural events are held in the open-air theatre. There are also a number of museums in the northern part of the city, which have various discounts and free days. There is the National Archaeological Museum, which is 10 euro or 5 euro to enter in winter, but is free on the first Sunday of November, December, January, February and March according to the website, as well as on a variety of special occasions and for certain visitors (see the website for details). You can also a purchase a 15 euro multi ticket which allows you to visit the Numismatic Museum of money (usually 6 euro, or 3 reduced, but free on the first Sunday of every month as above, and for special occasions or for special visitors), the Byzantine and Christian Museum (usually 4 euro, but free if you’re under 18, and for everyone on certain special occasions) and the Epigraphic Museum. The last of these is housed in the same building as the National Archaeological Museum – just exit the main building and walk up the street on the right hand side to enter, and was easily the most interesting place we visited in Athens. If you are a lover of languages and/or archaeology you will love this place (usually 4 euro, or 2 reduced, but free every first Sunday of the month as above, and on a variety of other special occasions. The museum has a very extensive ‘free’ list for certain visitors, so make sure to check the website). If none of these free options apply to you, buying the 15 euro special ticket will save you 9 euro off the full price if you plan on visiting all of the museums. HOWEVER, if you visit during the winter, it is actually cheaper to buy the tickets separately. Even though the Byzantine and Christian Museum does not offer any reduction during this period, the other museums halve their prices making it marginally cheaper not to buy the special ticket, UNLESS you want to visit the museums over several days, revisiting one or more of the museums, in which case it remains a good deal – the ticket is apparently valid for 3 days. Other museums include the Hellenic Motor Museum (only free for children under 5), the School Life & Education Museum, and the Technopolis City of Athens. Although we didn’t have time to visit the Benaki Museum, we did go to an exhibit sponsored by the museum in Melbourne, and saw some exquisite pieces. Normally 7 euro, you can visit for free on a Thursday according to the website. Well worth a look, we would have visited had we not just arrived on the Thursday! A number of galleries also exist in these parts – the National Museum of Contemporary Art (free on Thurdays 5-10pm and on International Museum Day), the Nikos Hadjikyriakos-Ghika Gallery, and the Museum of Cycladic Art, which is half price on Mondays (check their website to see if you’re eligible for free entry).